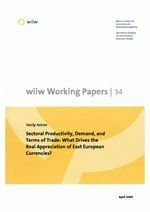 Sectoral Productivity, Demand, and Terms of Trade: What Drives the Real Appreciation of the East European Currencies? Since the start of transition, the currencies of most East European countries have experienced an abrupt real depreciation, followed by a trend real appreciation over the subsequent years. Within the framework of a panel-data study for eight Central European transition countries - Hungary, the Czech Republic, Poland, Slovakia, Slovenia, Bulgaria, Romania, and Croatia - over a period of up to 12 years, we attempt to explain their real exchange rate movements against the ECU/euro. Theory suggests that in the medium and long run, real exchange rate movements can only be explained by real shocks, such as the shifts in tastes and technology. We construct a model decomposing real exchange rate movements into two components: the changing relative price of tradables (the shifts in terms of trade, reflecting the quality upgrading of the countries' exports) and the changing relative price of non-tradables, relating the latter variable to cross-sectoral productivity differentials (capturing presumably the so-called Balassa-Samuelson effect). Our findings suggest that not only the tradable sector productivity and the share of government in GDP, but also the terms of trade are significant determinants of the real exchange rate. However, controlling for sectoral productivities, we found no positive correlation between real exchange rate and per capita GDP, suggesting the relative unimportance of demand effects associated with rising income. The latter finding implies that the trend real appreciation in the countries involved (i.e. higher domestic inflation under a fixed exchange rate arrangement within the framework of monetary integration with the EU) may prove more pronounced than usually assumed due to the possible demand-driven component, as living standards and consumption patterns in transition economies are expected to converge to those currently observed in West European countries.